One of the best ways to create content is to repurpose already existing content! If you are blessed with creative talent, this is still worth a read because you can reuse the content you have already created. You got into the real estate business to sell homes and make money. You have some very useful skills when it comes to interacting with people and getting them to like you. One issue many real estate agents struggle with is being found online. An easy way to improve your search engine optimization is through blogging. A great way to increase your referral traffic is through social media. The two entities don’t need to be separate from each other though! First thing is first, choose a blog to repurpose. It can be your blog, or it can be somebody else’s blog. What matters is that it provides value to your potential real estate clients. 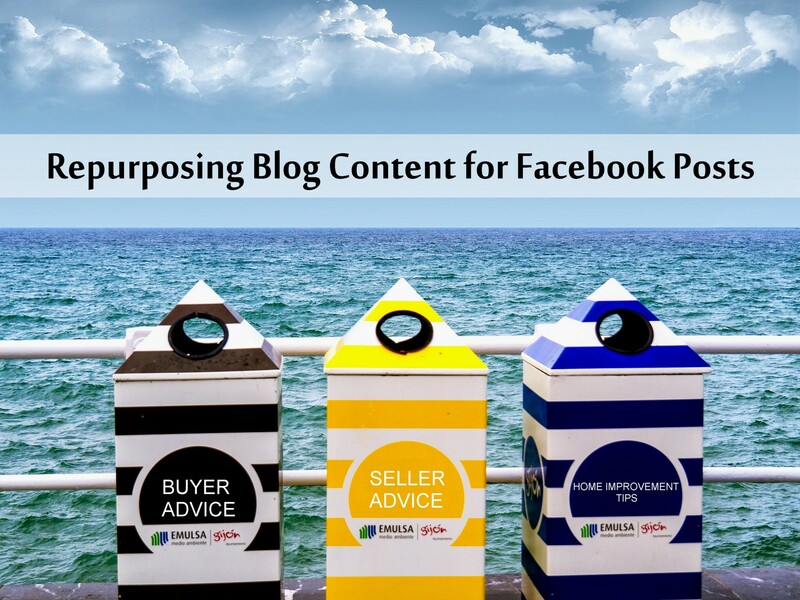 The best types of content to extract social posts from are lists. A few examples of list blogs you can use are 5 Reasons You Deserve to Relax this Labor Day, 5 Tips for Discussing a Real Estate Price Reduction, and 5 Tips for Selling Your Stale Real Estate Listings. A great way a home seller to increase home buyer appeal is to spruce up their home a bit! A little can go a long way! Here are examples of bad listing photos and good ones! Make sure your home looks attractive when you try to list it! One great way that I can get your home out in front of thousands is by using Facebook advertising to target people likely to be interested in your home. Has your home been on the market for a while? It might be worth a second look at how you are pricing it. Schedule the post for the future! An article about 5 reasons, 5 things, 5 examples, etc gives you 5 different posts! Schedule those posts for the future so now you have at least a week of posting content. If you wrote the article yourself, you can link back to your blog to create referral traffic! A Home Seller’s tip about curb appeal can be posted this week, three months from now, and the same date next year! You can essentially use the same posts over and over, and tweak them to improve their performance. And while it is not very complicated to do this, we realize there are more important things you can do with your time. This is why PropertyPulse was developed to do this work for you. We create a website and social media presence that communicates with each other. A blog is added to your website, and then is posted to your Facebook page, which is linked back to your website! This creates more website traffic, facebook fans, and real estate leads. Why don’t you give the Autoposter Tool a try, and let us do the engagement for you?